There he was. A wet, shivering little puppy on the side of the road, found in the days after hurricane Harvey devastated the city with historic flooding. Most of Houston was still underwater–including the main building for our hospital, Gulf Coast Veterinary Specialists (GCVS). A good Samaritan saw the puppy, picked him up, and braved the flood waters to rush him to the secondary GCVS location at 3800 Southwest Freeway. Historically the Neurology & Neurosurgery location, this facility was now serving as the home base for several of the GCVS departments that had been displaced when the main building flooded, including our Critical Care department. When the puppy–now named Chip–was first assessed by the Critical Care specialists at GCVS, he was in shock from blood loss due to severe hemorrhagic (bloody) diarrhea. In addition, he was suffering from severe dehydration, severe hypotension (low blood pressure), severe hypothermia, hypoglycemia, severe anemia due to blood loss, and was significantly underweight. Chip’s condition was so severe that the doctors at GCVS gave him only a 50 percent chance of survival, and humane euthanasia was discussed as an option to keep him from suffering. That’s when things really started turning around for Chip. One of the Critical Care staff doctors brought in one of his own dogs to donate blood for a blood transfusion for Chip. Chip had been diagnosed with a severe hookworm infection, which helped explain his critical condition and blood loss. Hookworms are a fairly common condition for puppies in our area that are treated routinely by general practice veterinarians, however, due to the circumstances surrounding hurricane Harvey, Chip didn’t get the preventative care he needed to control the hookworms before the infestation became life-threatening. In addition to the aggressive IV fluids and blood transfusion Chip was already receiving, Chip’s Critical Care team was supplementing him with Dextrose to counteract his hypoglycemia, and began immediate treatment for the hookworms. Chip was ultimately hospitalized for four days in the Critical Care unit at the 3800 Southwest Freeway GCVS location, and as he recovered, so did the city. 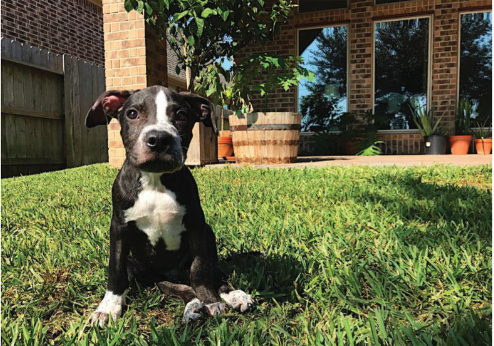 Just like our neighbors in Houston that banded together to save their loved ones, our GCVS family–along with several nearby veterinary hospitals–pulled together to save the life of one sweet little puppy. Chip is now doing great, recently got his third round of puppy shots and a microchip, and is generally behaving exactly like a four-month-old puppy should–digging all over the yard, jumping on the furniture without permission, and harassing all of the other dogs to play with him all the time (including the one who donated the blood that saved his life!). Because yes, Chip’s story ends in the best possible way. He found his forever home… with one of the very doctors who saved his life! GCVS is still in the process of recovering from the storm, but if your pet needs veterinary services, call GCVS today at 713-693-1111.